The Marvelous Mrs. Maisel is an American period comedy-drama web television series, created by Amy Sherman-Palladino, that premiered on March 17, 2017, on Amazon Video. The series stars Rachel Brosnahan as the eponymous Miriam "Midge" Maisel, a housewife in 1958 New York City who discovers she has a knack for stand-up comedy. Following the premiere of the pilot episode to critical acclaim, the series was picked up by Amazon for a two-season order on April 10, 2017. The first season was released on November 29, 2017, to positive reviews. The series won three Golden Globe Awards (Best Television Series – Musical or Comedy and two Best Actress – Musical or Comedy for Brosnahan) and five Primetime Emmy Awards, including Outstanding Comedy Series and Outstanding Lead Actress in a Comedy Series for Brosnahan. It was renewed for a third season on May 20, 2018, before the second season was released. The second season was released on December 5, 2018. The first season was released on November 29, 2017, to positive reviews. The series won three Golden Globe Awards (Best Television Series – Musical or Comedy and two Best Actress – Musical or Comedy for Brosnahan) and five Primetime Emmy Awards, including Outstanding Comedy Series and Outstanding Lead Actress in a Comedy Series for Brosnahan. It was renewed for a third season on May 20, 2018, before the second season was released. The second season was released on December 5, 2018. Set in 1958, Miriam "Midge" Maisel is a young, upper middle-class Jewish housewife living on the Upper West Side of Manhattan. Her husband of four years, Joel, a businessman working at a plastics company, moonlights as a comedian at The Gaslight Cafe, using other comics' material. After one particularly mediocre performance, Joel leaves Midge for his secretary. Midge drunkenly goes back to The Gaslight where she delivers an impromptu set, confessing her predicament to the audience. While her bawdy, biting, and brilliant delivery enthralls the audience, she gets arrested after baring her breasts. Midge meets comic Lenny Bruce, who has also been arrested for obscenity in his act. Midge is bailed out of jail, and she, in turn, bails out Bruce. Inspired to be a comedian herself, she teams up with The Gaslight employee Susie Myerson, who becomes her manager. After Midge and her two children move in with her parents, Rose and Abe, she lands a job in the cosmetics department at B. Altman, a high-end department store. In addition to an income, the job provides material for Midge's act. Midge visits New York clubs to study other comedians. She meets top comedienne, Sophie Lennon, who is completely unlike her frumpy, on-stage character. Sophie advises Midge to develop her own stage persona, but Midge prefers performing as herself. After Midge disparagingly reveals in her act that Sophie is actually a wealthy, snobbish socialite, she soon finds herself blacklisted from every club in the city. However, with Susie and Lenny's help, Midge performs again and proves she has what it takes be a professional comic. Joel secretly watches her act, and, dejected, realizes she is truly talented. After trying out numerous stage names, Midge settles on calling herself, "Mrs. Maisel". Rose moves to Paris after her New York social life falls apart. After having been oblivious to her departure for quite sometime, Midge and Abe travel there to persuade her to return home. Back in New York, Susie is abducted by two thugs working for Sophie Lennon's manager, who end up befriending her. They release her with the cautionary remark that others may come looking for her. After a period of enjoying life in Paris with and without Abe, Rose agrees to come home after Abe promises to be more like his vacation self and arranges for her to audit art classes at Columbia University, where he is a tenured mathematics professor. The family goes on their annual vacation at a Catskill Mountains resort. Susie, upset that Midge will be gone for two months, goes to the resort, and, pretending to be a staff person, works on booking gigs in the area. She books Midge at a large hotel where she gives a sexually-charged performance, during which she spots Abe in the audience. While at the resort, Midge meets Benjamin Ettenberg, a successful New York doctor whom she soon begins dating. With Abe the only family member knowing about her side-career, Midge continues performing. She wants to skip an important gig that Susie has booked because it is on Yom Kippur. When Susie insists that Midge perform, Abe says it is time to tell the family. Midge and Susie embark on a short comedy tour at various clubs outside of New York. Susie books Midge for a spot on a telethon, where Midge meets a famous singer, Shy Baldwin, but learns that Sophie Lennon controls the show. Still angry over Midge's having exposed her real identity, Sophie gets her bumped to the telethon's late-night end slot. Emboldened by knowing that fewer viewers are watching, Midge's all-out performance is a hit, and the phones light up with last-minute donations. Her performance prompts Baldwin to ask her to be his opening act on his six-month tour throughout the United States and Europe, which Midge immediately accepts. Meanwhile, Sophie, after Susie threatened her for her scheme against Midge and tired of her act, asks Susie to become her manager, saying she wants a manager who will fight for her like Susie does for Midge. Abe considers leaving both Bell Labs and Columbia University, fed up with their interference in his personal life. Benjamin proposes to Midge, despite her still being married to Joel. After watching Lenny Bruce's act about being alone, Midge ponders the personal cost of a full-time career. Rachel Brosnahan as Miriam "Midge" Maisel, a Jewish housewife who discovers her flair for stand-up comedy. After her husband leaves her, she finds a job as a make-up counter girl at B. Altman and starts performing stand-up comedy in clubs across New York. Alex Borstein as Susie Myerson, an employee of The Gaslight Cafe and Midge's manager. Michael Zegen as Joel Maisel, Midge's estranged husband, who leaves Midge for his secretary. A former employee of Tri-Borough Plastics, he leaves the company and ends up working with his father. He is also an aspiring stand-up comic, but only relies on the routines of Bob Newhart. Lenny Palmieri portrays a thirteen year old Joel in a guest appearance in the episode "Put That On Your Plate!". Marin Hinkle as Rose Weissman, Midge's mother. Tony Shalhoub as Abraham "Abe" Weissman, a mathematics professor at Columbia University, researcher at Bell Labs, and Midge's father. Kevin Pollak as Moishe Maisel (season 2, recurring season 1), the owner of Maisel and Roth Garment Company and Joel's father. Nunzio and Matteo Pascale as Ethan Maisel, Midge and Joel's eldest child. Matilda Szydagis as Zelda, the Weissmans' live-in maid. Brian Tarantina as Jackie, the emcee at The Gaslight. Caroline Aaron as Shirley Maisel, Joel's mother. Joel Johnstone as Archie Cleary, Imogene's husband and Joel's coworker. Bailey De Young as Imogene Cleary, Midge's best friend. Cynthia Darlow as Mrs. Moskowitz, Joel's secretary, former childhood nanny, and Penny's replacement. Luke Kirby as Lenny Bruce, a well-known New York City comedian and close friend of Midge's. Holly Curran as Penny Pann, Joel's former secretary and girlfriend. Will Brill as Noah Weissman, Midge's brother. He is secretly an analyst for the CIA. Justine Lupe as Astrid, Noah's wife and Midge's sister-in-law. She is very insecure about the fact that she was not born Jewish. David Paymer as Harry Drake, a successful manager of comedians with clients including Sophie Lennon. Jacob Kemp as Samuel, the Weissmans' staff helper at Steiner Mountain Resort. Jane Lynch as Sophie Lennon, a successful stand-up comic who relies on shticky gimmicks about her life in Queens and her frumpy appearance. In reality, she is a rich Manhattan aristocrat with refined taste and wears a fat suit on stage. Mary Testa as Drina Romanoff, a psychic that Rose frequents, until she leaves for the Bronx. Max Casella as Michael Kessler, Midge's lawyer and a former activist acquaintance of Abe's. In 1958 New York, Miriam "Midge" Maisel is a young, contented Jewish housewife living on Manhattan's Upper West Side. Married for four years to Joel, who works at his uncle's plastics company, she enjoys a busy social life while raising her son and baby daughter. She also facilitates her untalented husband's dream of becoming a stand-up comic at The Gaslight Cafe, considering it their shared hobby. When Joel upends their idyllic life by leaving Midge for his secretary, her parents, Abe and Rose (Weissman), believe it must be Midge's failure. Midge drunkenly goes to the Gaslight in her nightgown and gets on stage. She unloads her misery onto the audience, entertaining them with her spontaneous performance. After baring her breasts and performing without a cabaret license, Midge lands in a police car with comedian Lenny Bruce, who was arrested for using obscenity in his act. Susie Meyerson, the manager at The Gaslight, bails Midge out, later telling her she has a natural talent. The next morning, Midge bails out Lenny Bruce. Midge and Joel's breakup upsets the Weismans and the Maisels. In an effort to calm everyone, Midge invites her parents, her in-laws, Moishe and Shirley, and Joel to dinner at her apartment. Susie meets with Midge and encourages her to perform comedy, but Midge insists she will never get on stage again. Conflict erupts during the dinner and Joel's father announces that he plans to evict Midge and the children from her and Joel's apartment which he says he owns. Midge, upset, leaves and returns to the Gaslight where she performs again and is arrested a second time for obscene language. Midge, in jail again, is bailed out by Lenny Bruce. Midge starts performing at the Gaslight, leaving her unknowing parents baffled by their daughter's new single life and late-night hours. Midge and Susie hire a lawyer to address Midge's arrests, but in court, Midge clashes with the judge and is found in contempt and put in jail until she pays a $200 fine. She calls Joel, who agrees to pay the fine without knowing what Midge did. Meanwhile, Joel's father, Moishe, accepts Abe's offer to buy half of Midge and Joel's apartment. Midge joins Lenny Bruce at the Village Vanguard, where she does a short set. Susie visits the Friars Club to talk with Harry Drake (played by David Paymer) about Midge's career. Joel wants to give their marriage another try but Midge turns him down. When Joel and Midge's apartment is put on the market, Midge moves in with Abe and Rose. Abe, wanting to read, demands the TV be turned off when Midge's son, Ethan, is watching Howdy Doody. Midge suggests Abe buy a second TV for her room. Midge takes Ethan to visit Joel at his fancy new apartment, discovering he shares it with Penny Pann, his secretary/mistress. Midge is furious that he is living a nearly identical life as when they were married. Susie takes Midge to a used record store, owned by Virgil and Oz, to listen to buy underground comedy records. Susie also takes Midge to different clubs to study other comics, including Red Skelton. Midge wants her and Susie to be friends, but Susie only wants a professional relationship. Midge keeps her budding comedy career secret from her family, but when she arrives home particularly late, Abe and Rose are angry. When Abe says he will not buy her a TV, Miriam decides to get a job so she can buy one herself. Midge lands a job at B. Altman in the cosmetics counter. Performing at the Gaslight, Midge fails to get laughs for the first time. She hires comedy writer, Herb Smith (Wallace Shawn), but when she bombs even worse using his material, tells Susie she wants to give up on stand-up career. Meanwhile, Joel takes Penny Pann to meet his parents, who are charming but consider her unsuitable for Joel. Joel's coworker, Archie, cancels a double date with Joel and Penny to a Broadway show, giving awkward excuses about why he and his wife (Midge's close friend), Imogene, are unable to attend. Midge attends a party with her work friends and entertains the guests with an impromptu comic routine. Susie stares unhappily at the telephone she bought to be Midge's agent. Midge regularly entertains (unpaid) at parties hosted by her new B. Altman friends, performing alongside Randall (played by Nate Corddry), a comic who later introduces her to his William Morris agent. Abe, a Columbia University professor, is recruited to join Bell Labs. To celebrate, Midge, her parents, and Midge's brother, Noah, and his wife, Astrid, (a gentile who converted to Judaism to ingratiate herself to the Weissmans) have dinner at a Chinese restaurant. However, the occasion is marred by Joel and Penny Pann, who happen to be there. Joel apologizes, then notices Midge no longer wears her wedding ring. Susie sternly tells Midge to quit entertaining at parties for free and start seriously pursuing a comedy career. She is angry that Midge met with the William Morris agent. Midge tearfully apologizes but insists that Susie needs to be supportive if they are to be professional partners. The two reconcile and agree to formalize their partnership. As the episode ends, Virgil and Oz from the record store are seen laughing at a tape of Midge's earlier comic performances. Not knowing her name, they label the tape as, "Mrs. X at the Gaslight," intending to sell it. Midge hones her comedy act and tries out different stage names while Susie works to get Midge to open for comedienne Sophie Lennon. At work, Joel's ideas lead to promotion and a big raise. Abe brings home a surprise dinner guest—a divorce attorney. Rose is furious when Abe informs her that Midge refused to reconcile with Joel. Rose seeks consolation from Drina, her psychic, but Drina has vanished, replaced by "Madame Cosma." Joel, who has broken up with Penny Pann, tells Abe that he can now afford to support Midge and the children, though Abe notes there would be little left for Joel to live on. Midge visits Sophie Lennon (played by Jane Lynch), discovering that the beloved comedienne "from Queens" is really a rich and arrogant graduate of Yale University. Onstage "Sophie" is a gimmick character in a fat suit and says female comics need a fake persona to succeed. As Midge leaves, Sophie forces a slightly used mink coat on her. Rose loudly demands to know where Midge got the coat when Midge meets them at synagogue. Later, at the Gaslight, Midge lampoons expectations imposed on female comedians, and ridicules Sophie Lennon, exposing her act in the process. Sophie's agent Harry Drake, in the audience to watch Midge perform, is furious, and tells the terrified Susie, "You're on my bad side!" At a bar, Susie and Midge get drunk and worry that Harry Drake will sabotage Midge's career after Midge lambasted Sophie Lennon in her act. The next day, a hungover Midge hosts Ethan's birthday party where she reconnects with Joel. They end up sleeping together in her childhood bedroom. It appears they may reconcile, but after Joel overhears a bootleg tape of Midge's boozy first Gaslight act while at Virgil and Oz's record store, he storms out upset. During a big company meeting, a deflated Joel announces he is quitting. Meanwhile, Midge has been blacklisted from most New York clubs. Susie begs Lenny Bruce to perform at the Gaslight to draw in crowds and help Midge. He agrees, and Midge's opening act is a huge hit. Joel shows up at the Gaslight and watches Midge's act. Stung by her unflattering comments about their marriage, he argues with Susie then dejectedly leaves the Gaslight. Outside, he attacks a heckler while proclaiming that Midge is great. Midge ends the act by introducing herself as, "Mrs. Maisel." After Penny Pan makes a scene at B. Altman blaming Midge for Joel leaving her, Midge is demoted to switchboard operator in the basement. When an unhappy Rose makes an impromptu move to Paris, Midge and Abe follow to persuade her to return home. Susie is abducted by hoodlums working for Sophie Lennon as retaliation for Midge's dissing her during her act. Susie makes friends with them, and they let her go, warning that other thugs may come looking for her. Midge lands a gig at a comedy show, but learns how difficult it is for female comics to be taken seriously. After the male comics demean her, she hilariously retaliates during her act. Meanwhile, in Paris, Rose and Abe acclimate to Parisian life while reconnecting with one another. Abe eventually convinces Rose to return home. Back in New York, Joel, temporarily living with his parents, discovers several devious goings-on behind the scenes at Maisel & Roth, though his stubborn parents resist his findings and proposed solutions. Joel deflects Midge's attempts to reconcile. Midge gets a temporary promotion from switchboard operator to coat check girl, though things quickly go awry. She also helps plan a friend's wedding but discovers how much she has changed when she impulsively gives a risque speech at the couples' reception. Abe pulls strings for Rose to audit art classes at Columbia, though she receives a shock at the first session. The Weissmans depart for their annual two-month vacation at Steiner's Resort in the Catskill Mountains. Joel and the Maisels are also vacationing there. Susie follows Midge to the resort, posing as a staff person while working to book Midge comedy gigs in the area. Joel inadvertently discovers Abe's secret early-morning exercise routine, embarrassing his father-in-law. Midge is uncomfortable with her parents maneuvering her into meeting Benjamin Ettenberg, an eligible New York doctor staying at the resort. Midge rushes back to New York when B. Altman calls, needing a temporary fill-in at the cosmetic counter. She also begins dating Benjamin despite her original misgivings. She returns to the Catskills to perform at a hotel, discovering during her act that Abe is in the audience. Tension between Abe and Midge increases after his discovery that she is a stand-up comedian. Joel continues adjusting to renewed bachelorhood. Susie becomes overly immersed in her Steiner resort persona. Midge receives a proposition from a well-known but eccentric artist after Benjamin introduces her to New York's art world. A Yom Kippur dinner on the anniversary of her and Joel's separation is filled with tension. Susie needs to raise funds for her and Midge to go on a short comedy tour. Somewhat out of desperation, she turns to her dysfunctional family for help. Midge and Susie hit the road on a short comedy tour, traveling in a vintage Model A Ford that Susie "inherited" from her mother. They soon find touring is harder than expected. Joel intervenes on Midge's behalf when a club owner refuses to pay her. Knowing it is still business as usual in New York leaves Midge wondering if comic success is worth personal and family sacrifice. Midge's first television appearance on a fundraising telethon is marred when she and Susie discover that Sophie Lennon is also appearing. They worry that Sophie is still retaliating against Midge, unnerving Midge and enraging Susie, who angrily confronts Sophie. Joel becomes overly immersed in turning Maisel & Roth around. Joel's father offers him $60,000 to leave the company to instead pursue something he really wants to do in life. Joel considers opening a club. Abe is not as happy at Bell Labs as he originally thought he would be. After a still vengeful Sophie uses her influence to bump Midge the latest time slot on the telethon, Midge turns a "punishment" into a huge hit. Rose visits her psychic who "sees" Midge in front of a large audience, which Rose assumes is a wedding. A flashback shows Joel proposing to Midge (without first asking her father for permission). Meanwhile, Benjamin asks for Abe's permission to marry Midge, despite her still being married to Joel. Abe requires that Ben provide relatively intrusive personal details before deciding. Abe wants to quit Bell Labs and Columbia University to return to social activism. Sophie Lennon wants Susie to become her manager, saying no one fights for her the way Susie does for Midge. After seeing Midge perform, singing star Shy Baldwin asks her to open his six-month tour in the US and Europe; she immediately accepts. After being pulled offstage for discussing pregnancy, a dejected Midge encounters Lenny Bruce in a bar. Lenny, equally dejected and nearly broke, says there are arrest warrants out for him (for obscene language in his act). Midge goes with Lenny when he performs on Steve Allen's TV show, but his "All Alone" routine incites fears that she will end up successful but alone. Meanwhile, Abe gives his approval for Midge and Benjamin to marry. Midge goes to see Joel after Lenny's show, saying she wants to spend the night with someone who loves her. In devising the series, Amy Sherman-Palladino was inspired by childhood memories of her father, a standup comedian based in NYC, and an admiration for early female comics such as Joan Rivers and Totie Fields. On June 6, 2016, it was announced that Amazon had given the production a pilot order. The pilot episode was written by Sherman-Palladino, who was also expected to executive produce. On March 2, 2017, it was reported that the pilot would premiere as a part of Amazon's Spring 2017 pilot season on March 17, 2017. On April 10, 2017, it was announced that Amazon had given the production a series order consisting of two seasons. The series was expected to be executive produced by Sherman-Palladino and Daniel Palladino with Dhana Gilbert serving as a producer. On October 10, 2017, it was reported that the series would premiere on November 29, 2017. On May 20, 2018, it was announced that Amazon had renewed the series for a third season. On October 24, 2018, it was announced that the second season would premiere on December 5, 2018. On August 5, 2016, it was announced that Rachel Brosnahan had been cast in the pilot's titular lead role. In September 2016, it was reported that Tony Shalhoub and Michael Zegen had joined the pilot's main cast. On October 6, 2016, it was announced that Marin Hinkle had been cast in one of the pilot's main roles. In May 2017, it was reported that Joel Johnstone, Caroline Aaron, Kevin Pollak, and Bailey De Young were set to appear in recurring roles. On May 23, 2018, it was announced that Zachary Levi would appear in the second season in a recurring capacity. On August 15, 2018, it was reported that Jane Lynch would reprise her role of Sophie Lennon in recurring capacity in season two. Principal photography for the pilot took place from September 27 to October 14, 2016 in Manhattan. On October 4 and 5, 2016, filming took place at 96 St. Marks Place where exterior shots were being filmed. Residents of the building used for filming were reportedly unhappy about the disruption that the production would cause. The "apartment" where Midge and her husband Joel live was created on the same set as the apartment where Midge's parents live, but with more modern (late-1950s) design, inspired in part by Doris Day movies, according to production designer Bill Groom. The retro looking typeface used for the main title is called Sparkly and was designed by Stuart Sandler of Font Diner. The pop-up restaurant modeled after Carnegie Deli. On October 10, 2017, the official trailer for the first season was released. On August 9, 2018, a teaser trailer for the second season was released. On October 24, 2018, the official trailer for season two was released. 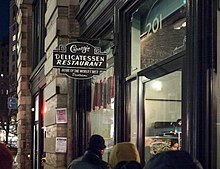 From December 1–8, 2018, Amazon operated up a pop-up restaurant in Manhattan's Nolita neighborhood modeled after Carnegie Deli as it appeared during the 1950s. The restaurant served a menu much more limited than what was actually offered at the original deli with the only two sandwich options being "The Maisel" and "The Susie". Other items offered included mini knishes, black and white cookies, cheesecake, and pickles. As the resaurant was purely for promotional purposes, nothing on the menu cost more than 99 cents and all the proceeds went to support the Lower Eastside Girls Club. On November 13, 2017, the series held its official premiere at the Village East Cinema in New York City. The first season was met with a positive response from critics upon its premiere. On review aggregator Rotten Tomatoes, the season holds a 95% approval rating, with an average rating of 7.63 out of 10 based on 78 reviews. The website's critical consensus reads, "The Marvelous Mrs. Maisel is an upbeat addition to Amazon's original offerings, propelled by a playful yet poignant performance by Rachel Brosnahan." On Metacritic, the series has an average weighted score of 80 out of 100, based on 27 critics, indicating "generally favorable reviews". The pilot episode of The Marvelous Mrs. Maisel was one of Amazon Video's most successful ever, achieving an average viewer rating of 4.9 (out of 5). The review of the pilot in The Guardian praised the combination of Sherman-Palladino's "banging dialogue and the utterly winning charm of Brosnahan", while The A.V. Club praised the "outstanding" production design] and said "this is a series that's as confident as its heroine—and what a heroine she is." A critic for Slate called the episode "a knockout", stating that the stand-up element "introduces a welcome streak of discipline, both verbal and thematic, into Sherman-Palladino’s charming but manic work." The Jerusalem Post highlighted the exceptionally well done "Jewishness" of the work, calling it a "comedic delight of a show, combining Sherman-Palladino’s knack for witty dialogue with the colorful, rich world of 1950s New York and the intensity of family drama and changing times." NPR similarly highlighted the effectiveness of the comedy in the show, calling it "a heroic fantasy." The second season was met with a positive response from critics upon its premiere. On Rotten Tomatoes, the season holds a 91% approval rating, with an average rating of 8.37 out of 10 based on 66 reviews. The website's critical consensus reads, "Like Midge herself, The Marvelous Mrs. Maisel charges full speed ahead in a second season brimming with warmth, empowerment, and a whole lot of laughs." Metacritic assigned the season a score of 85 out of 100 based on 24 critics, indicating "universal acclaim". ↑ Starkey, Adam (November 29, 2017). "Rachel Brosnahan on how 'trailblazer' Joan Rivers inspired Marvelous Mrs Maisel". Metro. Retrieved December 12, 2017. ↑ Soloski, Alexis (November 21, 2017). "Did You Hear the One About the Housewife Who Walks Into a Comedy Club?". The New York Times. Retrieved December 12, 2017. ↑ Busis, Hillary (March 16, 2017). "Gilmore Girls Creator Amy Sherman-Palladino Explains her Marvelous New TV Series". Vanity Fair. Retrieved June 29, 2018. ↑ Andreeva, Nellie; Jaafar, Ali (June 6, 2016). "Amazon Orders 5 Pilots from Guillermo del Toro, Amy Sherman-Palladino & Others". Deadline Hollywood. Retrieved July 12, 2018. ↑ Andreeva, Nellie (March 2, 2017). "Amazon Spring 2017 Pilot Season Set: 5 Pilots, Including Amy Sherman-Palladino's 'Marvelous Mrs. Maisel' & 'Master Legend'". Deadline Hollywood. Retrieved July 12, 2018. 1 2 Andreeva, Nellie (April 10, 2017). "Amy Sherman-Palladino's 'Mrs. Maisel' Gets 2-Season Series Order At Amazon". Deadline Hollywood. Retrieved July 12, 2018. 1 2 Petski, Denise (October 10, 2017). "'The Marvelous Mrs. Maisel' Gets Fall Premiere Date & Trailer". Deadline Hollywood. Retrieved July 12, 2018. ↑ Littleton, Cynthia (May 20, 2018). "'The Marvelous Mrs. Maisel' Renewed for Season 3 by Amazon (EXCLUSIVE)". Variety. Retrieved July 12, 2018. 1 2 Turchiano, Danielle (October 24, 2018). "Amazon Announces 'The Marvelous Mrs. Maisel' Season 2 Premiere Date (Watch)". Variety. Retrieved October 24, 2018. ↑ Andreeva, Nellie (August 5, 2016). "Rachel Brosnahan Cast As the Lead In Amy Sherman-Palladino's Amazon Pilot". Deadline Hollywood. Retrieved July 12, 2018. ↑ Petski, Denise (September 13, 2016). "Tony Shalhoub Cast In 'The Marvelous Mrs. Maisel' Amazon Pilot". Deadline Hollywood. Retrieved July 12, 2018. ↑ Petski, Denise (September 19, 2016). "Michael Zegen Cast In 'The Marvelous Mrs. Maisel' Amazon Pilot". Deadline Hollywood. Retrieved July 12, 2018. ↑ Andreeva, Nellie (October 6, 2016). "'The Marvelous Mrs. Maisel': Marin Hinkle Joins Amy Sherman-Palladino Pilot". Deadline Hollywood. Retrieved July 12, 2018. ↑ Petski, Denise (May 4, 2017). "'The Marvelous Mrs. Maisel': Joel Johnstone & Caroline Aaron Set To Recur". Deadline Hollywood. Retrieved July 12, 2018. ↑ Petski, Denise (May 9, 2017). "'The Marvelous Mrs. Maisel': Kevin Pollak & Bailey De Young Set To Recur". Deadline Hollywood. Retrieved July 12, 2018. ↑ Goldberg, Lesley (May 23, 2018). "'Marvelous Mrs. Maisel' Recruits Zachary Levi for Season 2 (Exclusive)". The Hollywood Reporter. Retrieved July 12, 2018. ↑ Andreeva, Nellie; Petski, Denise (August 15, 2018). "Jane Lynch To Reprise Emmy-Nominated Role On 'The Marvelous Mrs. Maisel'". Deadline Hollywood. Retrieved August 15, 2018. ↑ Mink, Casey (September 9, 2016). "Now Casting: Amazon Pilot 'The Marvelous Mrs. Maisel' and More". Backstage. Retrieved July 12, 2018. ↑ "Filming at Physical Graffiti building angers residents". Page Six. September 30, 2016. Retrieved July 12, 2018. ↑ Zuckerman, Esther (November 28, 2017). "Corsets and Comedy: Inside Amazon's The Marvelous Mrs. Maisel". Vanity Fair. Retrieved June 29, 2018. ↑ Beery, Zoë (January 10, 2018). "That font you hate is coming back in style". The Outline. Retrieved July 12, 2018. ↑ Patten, Dominic (August 9, 2018). "'The Marvelous Mrs. Maisel' Is Going To The Catskills In Season 2 Teaser". Deadline Hollywood. Retrieved August 9, 2018. ↑ Pomranz, Mike (November 27, 2018). "New York's Iconic Carnegie Deli Returns as a Pop-Up Thanks to 'The Marvelous Mrs. Maisel'". Food & Wine. Retrieved January 11, 2019. ↑ Cox, Lauren (November 27, 2017). "'The Marvelous Mrs. Maisel's Rachel Brosnahan: Midge Is An 'Upologetically Confident' Woman". Hollywood Life. Retrieved July 12, 2018. ↑ "The Marvelous Mrs. Maisel: Season 1". Rotten Tomatoes. Fandango. Retrieved August 14, 2018. ↑ "The Marvelous Mrs. Maisel: Season 1". Metacritic. Retrieved August 14, 2018. ↑ Raeside, Julia (March 16, 2017). "The Marvellous Mrs Maisel: from the writer of Gilmore Girls, with brazen nods to Mad Men". The Guardian. Retrieved September 25, 2017. ↑ Zuckerman, Esther (November 29, 2017). "Amy Sherman-Palladino's The Marvelous Mrs. Maisel pilot lives up to its title". The A.V. Club. Retrieved September 25, 2017. ↑ Paskin, Willa (March 20, 2017). "Amid a Slew of Lackluster Amazon Pilots, Amy Sherman-Palladino's The Marvelous Mrs. Maisel Is a Knockout". Slate. Retrieved September 25, 2017. ↑ Spiro, Amy (December 6, 2017). "The 'marvelous' Jewish story of Miriam Maisel". The Jerusalem Post. Retrieved December 7, 2017. ↑ Powers, John (December 4, 2017). "Zippy And Delightful, 'The Marvelous Mrs. Maisel' Spotlights An Unlikely Comic". NPR. Retrieved December 7, 2017. ↑ "The Marvelous Mrs. Maisel: Season 2". Rotten Tomatoes. Fandango. Retrieved December 25, 2018. ↑ "The Marvelous Mrs. Maisel: Season 2". Metacritic. CBS Interactive. Retrieved December 25, 2018. ↑ Plaugic, Lizzie (January 8, 2018). "Amazon's The Marvelous Mrs. Maisel wins the 2018 Golden Globe for best TV comedy". The Verge. Retrieved January 8, 2018. ↑ Strause, Jackie (January 8, 2018). "Golden Globes: 'Marvelous Mrs. Maisel' Wins Best TV Comedy or Musical". The Hollywood Reporter. Retrieved January 8, 2018. ↑ Russian, Ale (January 8, 2018). "Amazon's The Marvelous Mrs. Maisel Wins 2018 Golden Globe for Best Comedy Series". People. Retrieved January 8, 2018. ↑ Piester, Lauren (January 8, 2018). "The Marvelous Mrs. Maisel Wins Golden Globe for Best TV Comedy But Is There Cheese Backstage?". E! News. Retrieved January 8, 2018. ↑ Swift, Andy (December 6, 2017). "Critics' Choice Awards 2018: Netflix, FX's FEUD Lead TV Nominations". TVLine. Retrieved January 2, 2018. ↑ Dupre, Elyse (January 5, 2018). "2018 Producers Guild Award Nominations: The Full List of Film and TV Nominees". E! News. Retrieved January 5, 2018. ↑ Ramos, Dino-Ray; Bennett, A (January 21, 2018). "PGA Awards: 'The Shape Of Water' Wins Outstanding Producer; 'Handmaid's Tale', 'Mrs. Maisel' Tops In TV – Full Winners List". Deadline Hollywood. Retrieved January 4, 2019. ↑ "DGA Announces Nominees for Outstanding Directorial Achievement in Television, Commercials and Documentary for 2017". Directors Guild of America. January 10, 2018. Retrieved January 10, 2018. ↑ Nolfi, Joey (January 10, 2018). "I, Tonya, Get Out earn Costume Designers Guild nominations". Entertainment Weekly. Retrieved January 10, 2018. ↑ Sandberg, Bryn Elise (February 22, 2018). "'The Crown,' 'Dunkirk' Among Locations Managers Guild International Awards Nominees". The Hollywood Reporter. Retrieved February 23, 2018. ↑ "Peabody Awards: The Marvelous Mrs. Maisel". Peabody Awards. Retrieved April 20, 2018. ↑ Moraes, Lisa de (August 5, 2018). "FX Russia Thriller 'The Americans' Takes TCA Trophies For Keri Russell, Best Drama And Program Of Year". Deadline Hollywood. Retrieved August 5, 2018. ↑ Koblin, John (September 17, 2018). "2018 Emmys: 'Game of Thrones' and 'Marvelous Mrs. Maisel' Win Top Awards". The New York Times. Retrieved September 18, 2018. 1 2 Hipes, Patrick (July 12, 2018). "Emmy Nominations: 'Game Of Thrones' Tops Noms, With Netflix & HBO Leading Way". Deadline Hollywood. Retrieved July 12, 2018. ↑ Lambe, Stacy (September 11, 2018). "2018 Creative Arts Emmy Awards: The Complete Winners List". Entertainment Tonight. Retrieved September 24, 2018. ↑ Macke, Johnni (September 24, 2018). "2018 People's Choice Awards: Complete List of Finalists on People's Choice Awards". E! News. Retrieved November 15, 2018. ↑ Pedersen, Erik (December 4, 2018). "AFI Awards 2018 TV: 'This Is Us' Is Lone Broadcast Show As FX Nabs Four Of 10 Slots". Deadline Hollywood. Retrieved December 4, 2018. ↑ Snierson, Dan (January 6, 2019). "Golden Globes 2019: See the full winners list". Entertainment Weekly. Retrieved January 6, 2019. ↑ Kilkenny, Katie (January 3, 2018). "Unsung Film of the Year – 'The Favourite,' 'Pose,' 'Killing Eve' Lead Dorian Award Nominations". The Hollywood Reporter. Retrieved January 9, 2018. ↑ Kilday, Gregg (January 8, 2019). "Dorian Awards: 'The Favourite' Named Film of the Year". The Hollywood Reporter. Retrieved January 8, 2019. ↑ Crist, Allison (January 13, 2019). "Critics' Choice Awards: 'Roma,' 'Americans,' 'Mrs. Maisel' Top Winners". The Hollywood Reporter. Retrieved January 13, 2019. ↑ McNary, Dave (January 20, 2019). "PGA Awards: 'Green Book' Wins Top Feature Film Award". Variety. Retrieved January 20, 2019. ↑ Nordyke, Kimberly (January 27, 2019). "SAG Awards: 'Black Panther' Nabs Top Film Prize; Rami Malek, Glenn Close Among Winners". The Hollywood Reporter. Retrieved January 28, 2019. ↑ Nordyke, Kimberly (January 31, 2019). "Casting Society of America's Artios Awards: 'Green Book,' 'Vice' Among Winners". The Hollywood Reporter. Retrieved February 1, 2019. ↑ Giardina, Carolyn (February 1, 2019). "'Bohemian Rhapsody,' 'The Favourite' Top Editors' ACE Eddie Awards". The Hollywood Reporter. Retrieved February 2, 2019. ↑ Giardina, Carolyn (February 2, 2019). "Art Directors Guild Awards: 'Favourite,' 'Black Panther,' 'Crazy Rich Asians' Among Winners". The Hollywood Reporter. Retrieved February 3, 2019. ↑ Handel, Jonathan (February 2, 2019). "'Roma's' Alfonso Cuaron Takes Top Honor at DGA Awards". The Hollywood Reporter. Retrieved February 3, 2019. ↑ Pedersen, Erik (January 7, 2019). "ASC Awards Nominations: 'Roma', 'A Star Is Born' & Others Make Cinematographers' Cut". Deadline Hollywood. Retrieved January 7, 2019. ↑ Pedersen, Erik (January 8, 2019). "CAS Awards: 'Black Panther', 'A Star Is Born' & 'Mrs. Maisel' Among Cinema Audio Society Nominees". Deadline Hollywood. Retrieved January 8, 2019. ↑ Pedersen, Erik (January 10, 2019). "Make-Up Artists & Hair Stylists Guild Applies Its Awards Nominations". Deadline Hollywood. Retrieved January 10, 2019. ↑ Pedersen, Erik (January 18, 2019). "Motion Picture Sound Editors Reveal 2019 Golden Reel Nominations". Deadline Hollywood. Retrieved January 19, 2019. ↑ Schwartz, Ryan; Gelman, Vlada (February 17, 2019). "Writers Guild Awards: The Americans, Mrs. Maisel and Barry Among Winners". TVLine. Retrieved February 18, 2019.